Please bear with me, there is another update to copy and paste over the webCoRE Storage app. Save and publish, then follow a new step just to make sure the device data has to be reloaded. In the ST app go to Automation > webCoRE > Settings > Available devices > Available devices (again) then tap Done in the upper right. No changes to authorized devices required, this is just a way to ensure that webCoRE refreshes some data for the devices and dashboard. Did all this, exact same result. I think I’m doing everything correctly, but is there some way to make sure it’s executing your new code and not some cached version of the old code? I’m grasping at straws here, but maybe some debug comments in the debug Storage piston so we can verify that your new code is actually running? Just finished up a screen share session with @wjarrettc, I am tremendously appreciative for your time. No part of the storage app is actually executing, I added debug logging and the loadAvailableDevices method where the debugging code has been added is never even called. It seems that the UndeclaredThrowableException is actually stemming from ST attempting to communicate with the storage smart app. The storage smart app state loads fine in the IDE and its application state does not include any unexpected devices. All of his automations seem to be operating normally. Recently a device appeared on his ST account that did not make sense; the device brand and model matched a sensor that he used in the past but the device name included the name of a person that he did not know. This was confirmed unrelated. The next step for @wjarrettc is to contact SmartThings support. He is going to lead with the Alexa skill issues in the hopes that the problem loading devices there is the same problem affecting webCoRE. This seems to be a fairly isolated incident. The best recommendation I have at this point for anyone else who is affected by this problem is to contact SmartThings and ask them to review any potential issues loading your devices or timeouts when running child apps like webCoRE Storage. There may be logs or tools on their end that will shed light on the issue. Tomorrow I hope to find time to look at potential workarounds. I do not get this error when adding or removing devices in the smarthings old app through the WebCoRE smartapp. I do not get any errors while trying to add or remove devices. This issue has been going on for at least a week now. Recently a device appeared on his ST account that did not make sense; the device brand and model matched a sensor that he used in the past but the device name included the name of a person that he did not know. @ipaterson just to tie off on this one. Upon further review, one of the custom device handlers I had in my IDE apparently had the name of that person in the DTH name. I expect what happened here is that ST found the old motion sensor on the z-wave network when I ran an “add device” routine and I didn’t notice it. If that happened, it would have added it using the devicetype handler name, so I think this is probably not related to this incident. Just clearing that up. Has anyone contacted SmartThings support yet as recommended in this reply? Jarrett was planning to call during the week but if anyone has had time it would be great to learn more about what is going on here. Phone support is not available on Sunday, they open at noon EDT / 9am PDT on Monday. I plan to call them Monday afternoon, work schedule allowing. Sorry, I was away this weekend, I do have some logs for you. This error I have seen before on another smartapp, and it was related to too many devices trying to be loaded. When I reduced the # of devices in that app the error went away. I am going to see if that possilby fixes it. I am curious in my screen shot below it is showing smart app pause, what is actually being paused? Support update: Called SmartThings support number on their website. Was connected to a tech fairly quickly after going through the automated menu routine. She quickly punted me over to SmartThings Classic support since I’m Hub v2 user on the classic app. Held there for about 20 minutes before putting in my phone number for a call back. Got a call back about 10 minutes later. Spent some time talking to the tech and then he escalated to his senior support tech. After about 10 more minutes on hold, they came back to me and said that they are seeing this issue which is the same as some other users had seen and it “was supposed to have been fixed already” and so they are escalating it to a higher level support team who will work on it now. He told me to expect to hear back later today hopefully on a fix. Fingers crossed. When I reduced the # of devices in that app the error went away. I tried this for my Alexa issue and it absolutely fixed my problem. Around 135 devices is the maximum that I can have Alexa discover before it times out. The default setting for the Alexa Skill/SmartApp is to make all your devices and routines available. That breaks for me, but if I go in specify specific devices, I can get Alexa to work. Since I’m not really using motion and contact sensors to trigger routines in Alexa, this is a fine workaround for this problem. I have a 2nd instance of WebCoRE that was created for my Presence Sensors back when the WC sensor needed to be installed in a separate instance. I can break the WebCore Dashboard on that second instance somewhere between 125-165 devices available, depending on server loading. It clearly seems to be a function of number of devices. I can confirm that by reducing my device count by 15 devices I can now get into my dashboard and pistons. Funny, now I have no live logging in the IDE, can’t ever win. Sorry @ipaterson that I also was not at home or by a desktop this weekend. Just catching up on this thread now. I just tried eliminating devices as @jasonrwise77 mentioned just above and that totally worked for me - dashboard even loads on the machine I have been unable to get it to load on for the last couple weeks! I am only putting one exclamation point on that sentence for now because I’ve experienced that it could load one day but not the next. But fingers crossed that we have a solution. Thanks very much @ipaterson @wjarrettc @jasonrwise77 for the team debugging and patience! So my ‘cleanup’ changed too many variables at once to isolate where the timeout may have happened, but hopefully this can help people who encounter this problem see an example of what didn’t work initially and what is working as of now (knock on wood). IDE Live Logging is also wfm (works for me). @wjarrettc Just curious, are you having any issues viewing your live logging? Mine seems to hang and it started when my webcore issues started. 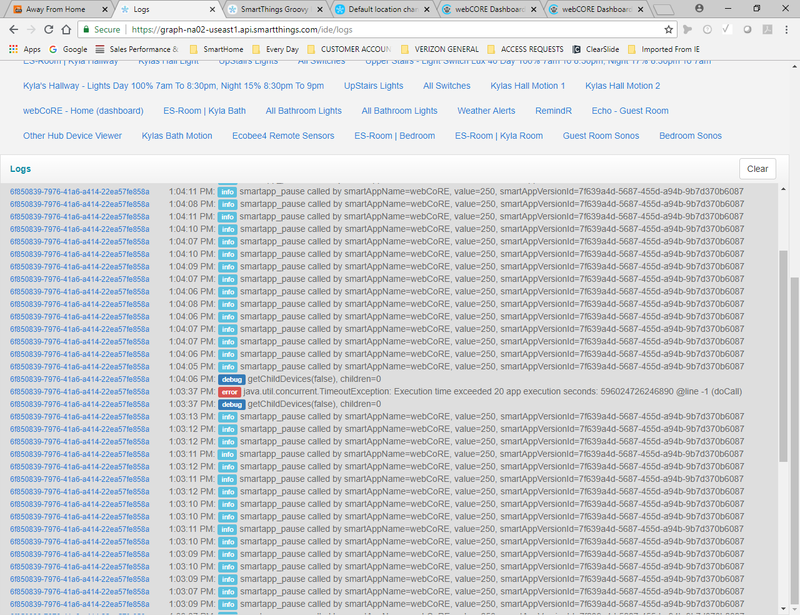 My live logging does work, but it takes like 20 to 30 tries before it starts to flow. Hmmm … last I heard there was something like a 300-device limit for querying in the ST database … dunno if this was ever changed. Even if a 300 device hard limit exists it appears you likely wouldn’t be able to hit it now before you reach that 20-second timeout. 60% of 300 seems to work ok.
Glad to hear all of this, hopefully ST can resolve what now seems to clearly be a reduction in the number of devices are supported. I only have about 30 physical devices so very far off from being able to test this. I guess I probably have about 50 but… so far behind in actually hooking stuff up. Note to self and minions: if there is an error related to devices find out how many devices are involved. I’m holding out hope that ST will fix the timeout, but short of that, I’m devising a backup plan to partition my devices between two instances and run them in parallel. Most of my pistons are room based (i.e., uses lights, motion, contact sensors, etc. only within a single room) so while this will be a pain, I think it will work. Incidentally, is there a way to call a piston in one instance from another instance? I have some ideas of a workaround using Routines, but if I could call them directly that would be awesome.